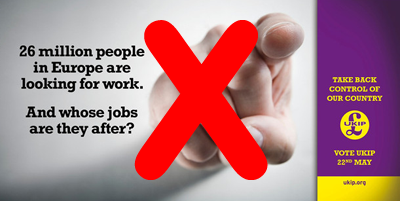 Green Party MEP Jean Lambert has pointed to the chasm between UKIP claiming to defend British workers jobs, while doing nothing to defend their rights at work. “There is no fixed number of jobs so it is misleading to assume that a British worker loses out every time a non-UK national gets a job. We should also not assume that every vacant job has a local applicant with the necessary skills. “We should be ensuring everyone in work has the same rights and earns a living wage. UKIP has not once defended workers’ rights in the European Parliament and frequently speaks of such rights – to control working time, to parental leave, to equal treatment – as “barriers to business”. She added: “This xenophobic campaign is just nasty: it is anti-foreigner and leaves many EU migrants – that’s more than a million people in London alone, and British citizens from diverse backgrounds, wondering whether they should be here at all. This entry was posted in National News and tagged "barriers to business", anti-EU poster campaign, Green Party MEP, Green Party MEP Jean Lambert, Jean Lambert, xenophobic campaign by tamesidegreens. Bookmark the permalink.